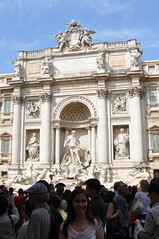 Rome – what an amazing city. 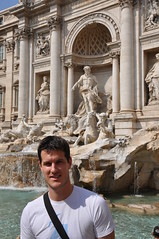 I had previously been to Rome in 2005 for a few days with my family and loved the sights and sounds of the city. So, Rob and I booked an apartment for a week and packed a summer wardrobe – it was going to be 30 degrees everyday. Awesome. We did a lot of walking all over the city, and saw so many beautiful and surprising sights. 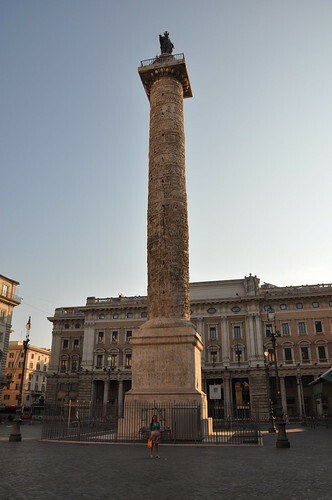 On the way to the Sistine Chapel, we went past the Piazza Colonna, the huge marble Column of Marcus Aurelius (an adopted son of Hadrian) which has stood there since 193 AD. A very impressive monument with such a detailed relief that has survived the weather for centuries. 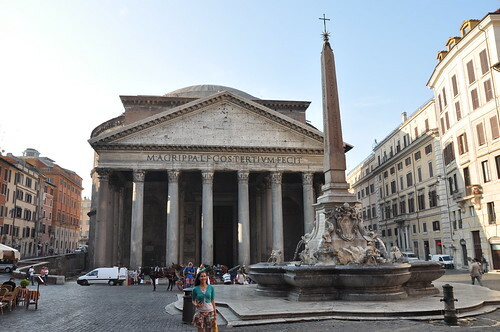 We wandered past the Pantheon, which we later revisited for more photos. Built by Hadrian where Marcus Agrippa’s original temple (27BC) stood, this temple-turned-church has been hanging around since 120 AD. 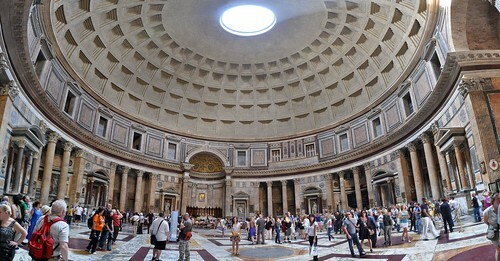 The dome of the church is truly stunning though, a perfect semisphere and the ancient Roman’s finest architectural feat. 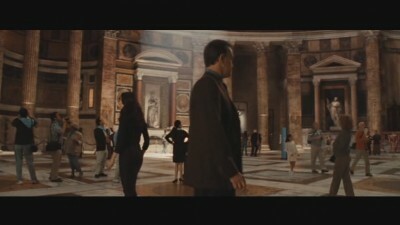 Of course, the Pantheon is also a movie location from Dan Brown’s Angels and Demons with Tom Hanks. Tom comes here to find Raphael’s tomb (back left corner) where another person has been killed. Or something grisly. 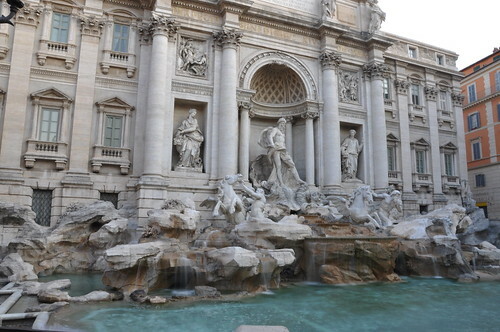 Piazza Navona is still a stunning sight with its beautiful fountains. 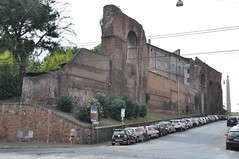 The baroque square used to be an ancient stadium of Domiziano built in 86 AD. 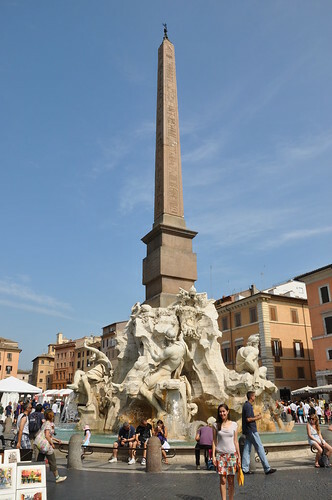 These days the centrepiece of the piazza is Bernini’s Fontana dei Quattro Fiumi (completed 1651), depicting the rivers Nile, Ganges, Danube and Plata. 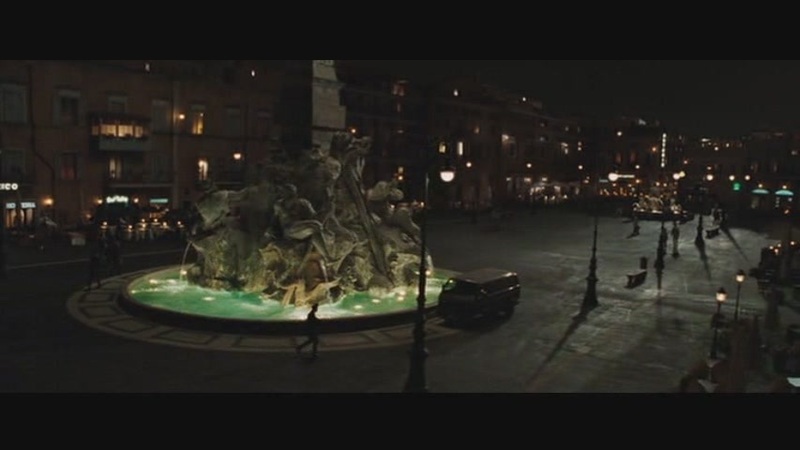 Also, this was the fountain from Angels and Demons, where a man was chained and tossed into the fountain to drown. I forget the details, but we were there! 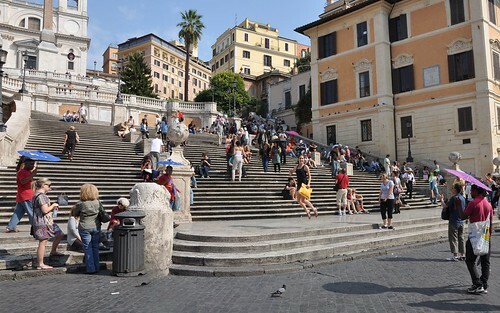 We found our way to the Spanish Steps where there were so many salesmen trying to force roses and umbrellas into your hands. But the stairs are still pretty, and it was a nice day to chill out. 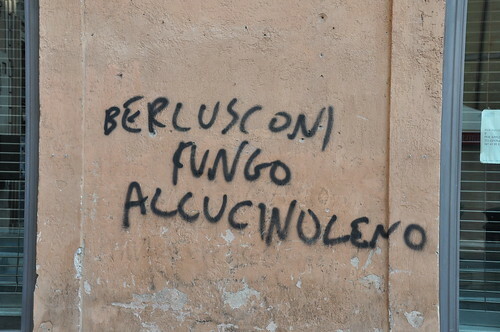 There are ruins everywhere in Rome, though. 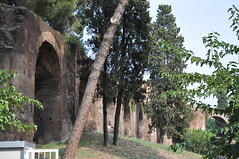 Left from Roman times, with barely any acknowledgement, the ruins are just there – In public parks, next to shopping centers, partially used as museums, and partially just ruins. They’re everywhere. It was so bizarre and amazing. Like these aquaducts we found further out from town. Just sitting there. 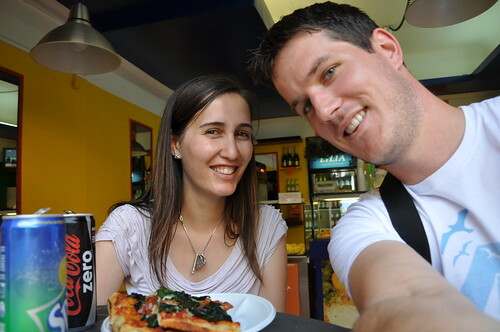 We had an amazing week in Rome, and this is just the introduction. We’ve got a few blog posts coming up (with a few more references to Angels and Demons), but look out for the Colosseum and the Vatican posts. Some pretty amazing sights. Please note the lack of glasses in this photo. My lasered eyes are working great, and surgery was done just in time for Rome. Whoop whoop!